Clothed in dazzling sunlight, She melts the snow. All this She brings as gifts to the Earth. 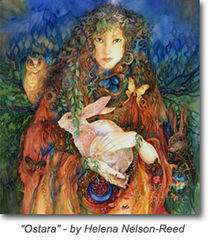 Ostara steps lightly and brings in the Spring. Innocent Maiden, we welcome you in! The balance has shifted, light over dark. A young man now; coming into His strength. Shall our seeds now be planted O Goddess of Spring? Shall we reap what we sow come autumn’s chill wind? As your kindness and joy spreads through the land. She offers us the sacred egg, what does it mean? Fertility, birth, the Circle completes. The egg of the human, all in her hands. Creatures of innocent beauty are Hers. Morning dew restores beauty to those who believe. Dreams of honey, milk, and orchards of fruit. Dreams of dancing all night by the summer moon. Wings shimmer and glamour all that can see. Color your eggs, fill your baskets and light a bonfire. Rejoice in the sunlight, dance on your lawn. Plant seeds in your gardens of earth and spirit. Rose quartz, aquamarine, moonstone and amethyst. Bless Them with love for all of your days.